Q. I really don’t like drinking water but worry that drinking squash each day isn’t good for me? I really appreciate the honesty of this question. Squash is a sweet beverage that is made by diluting a concentrated syrup, which typically consists of concentrated juice and sugar with water or carbonated water. I can understand that preferring to drink squash and other beverages is a natural consequence to not liking water. Having everyone drinking all the water they need consistently is like a magic bullet that we need in the health and fitness world. However, we are all human and have our idiosyncratic behaviour. For example, if you manage to drink 1/3-1/2 of your daily water intake goal in plain water and drink the rest in the form of the ideas above, you will get to your daily water intake goal faster. You can meet your daily water intake goal more easily by making some small efforts to make water more appealing and fun. Does that sound doable? this summer and was also given a sample of sunflower oil from my friends at La Societe Orignal. This was what I came up with as a way to use honey and sunflower oil in the same dish, because those were the exciting new ingredients I procured that day. I’m still not sure where this idea came from, perhaps from ordering a pear, arugula and walnut salad on a Montreal patio and having the pear replaced with canned lychee(?). This is a really simple, and delicious salad to put together. The sauteed pears also pair very well with waffles and/or icecream (salted caramel was my pick). Core and slice 1-2 medium ripe pears. Heat 1/2 tbsp butter in a small skillet. Add 1/2 tbsp of Classe Ouvriere honey (ordinary honey is alright too). Stir pear slices in butter and honey mixture and saute until lightly browned and softened. 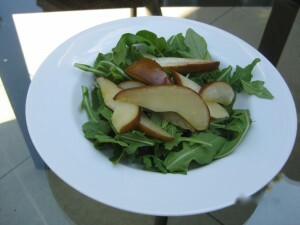 Place the desired amount of arugula (at least 2 large handfuls) onto a plate. Drizzle with sunflower oil. Top with sauteed pear slices and enjoy. This is a recipe I adapted from the Canadian Living Slow Cooker Collection. I found it worked just as well on the stove top. I use 3 types of lentils for the nutritional and texture variety. This is a brownish coloured soup that packs a lot of nutrition as a source of fibre, magnesium and folate on a cold day. In a large pot, heat olive oil over medium heat. Saute onion, garlic, tomato and celery until softened. In a strainer, rinse lentils thoroughly. Add lentils, bay leaf, thyme and vegetable stock to the pot. Bring to a boil, simmer over medium low heat for 30 minutes. Season with salt, pepper and lemon juice to your taste. Enjoy piping hot topped with finely chopped greens such as watercress or chard (the greens will wilt and cook lightly in the hot soup). This is a delicious, natural, calorie free beverage recipe that has a great story behind its origin. I was introduced to Minisyrup through a chance encounter at the Chicago airport earlier this year. Minisyrup is best described as a burst of flavour or a flavour enhancer, similar in concept to vanilla extract. Minisyrup flavours beverages with natural, concentrated flavour without any sugar or sweetener. Club soda or sparkling water is a non alcoholic beverage that I tend to prefer over plain water at home or in restaurants. It seems like more fun than water with the bubbles. 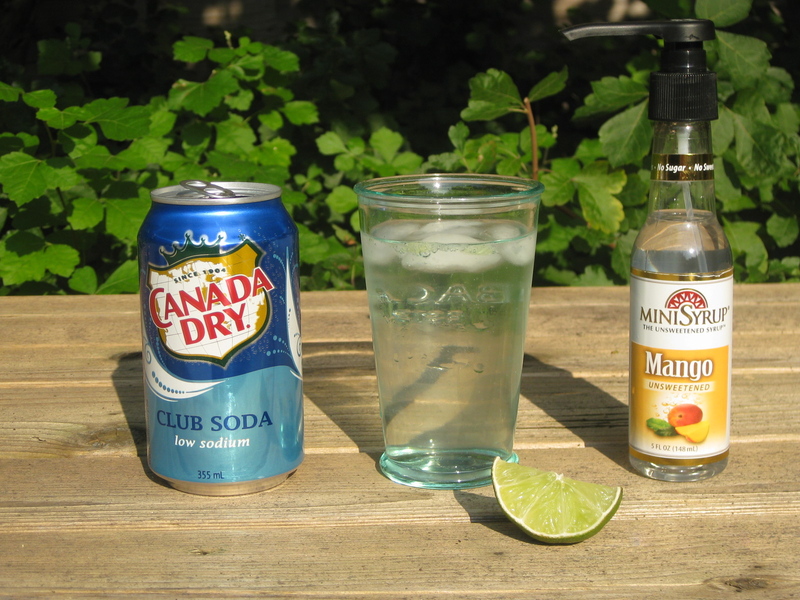 A good friend and I had some club soda with lime and mango minisyrup with our final outdoor lunch of the season last week and found it to be a superb non alcoholic beverage. We felt this was a great discovery, as she is always looking for an enticing drink to serve her teen children when she is pouring wine or cocktails for the adults. We tested the mango lime soda on her teens and they loved it! Here is the recipe, complete with photo inspiration from my young friend Francesca. Fill a tall glass with club soda and ice. Add a squeeze of fresh lime and 2 pumps of Mango minisyrup. Enjoy! Caribbean Corner (171 Baldwin Avenue) -I stop in here for fresh callaloo they get flown in from Jamaica, caribbean hot sauce, and/or jerk sauce, among all things caribbean. Essence of Life (50 Kensington Avenue)-is the stop for any health food or supplement you can think of with great selection and prices. Salamanca(204 Baldwin Avenue)-I have been buying nuts and other dry goods here for over 10 years. La Tortilleria (198 Augusta Avenue)-makes fresh tortillas daily, with organic blue available on the weekends only. Jumbo Empanadas (245 Augusta Avenue)-I have been stopping here for a bite of lunch for over 10 years. Their homemade salsa is unbelievable. The chicken empanada with the salsa and Chilean salad are absolutely delicious. Perola’s (247 Augusta Avenue)-This is a shop I just started frequenting this summer, as I developed serious taco obsession when I missed out on eating at Rick Bayless’ Torta in the Chicago airport. Tacos seem to be the trend of the moment as well. This shop has all the authentic fixings you could want. Wanda’s Pie in the Sky (287 Augusta Avenue)-Sometimes I stop here first. Amazing dessert is required. This shop is even more fun here than it was when it was located in Yorkville. I love the dulche de leche coconut macaroons (gluten free) and the small fruit pies (which I cut into 4 pieces and share, maybe). Seven Lives (69 Kensington Avenue)-My top pick for tacos in Toronto. There can be a bit of a wait, but service is quick and the tacos are incredibly flavourful and inventive. After perfecting the spicy mango lime dressing this summer, I worked on a gluten free noodle salad that would include lots of veggies to create more of a meal with the salad. Napa cabbage delivers a light crunch with a milder flavour and the sugar snap peas add a touch of sweetness with their crunchy texture. I quite enjoyed the blend of flavours and textures, and so did my testers. Cook noodles according to package instructions, drain and rinse with cold water. In a large bowl, toss together noodles, cabbage, sugar snap peas with the dressing, mix well. Top with mint, cilantro, and mango, mix again gently. Serve and enjoy at room temperature. Make this salad a meal by topping it with some lean protein of your choice. Try tofu cubes, shrimp, fish, grilled chicken or pork. My thought on flavour per calorie yesterday was inspired by this article. Culinary Intelligence is a book that is on my reading list. Making food choices based on taste and enjoyment sounds like fun to me! 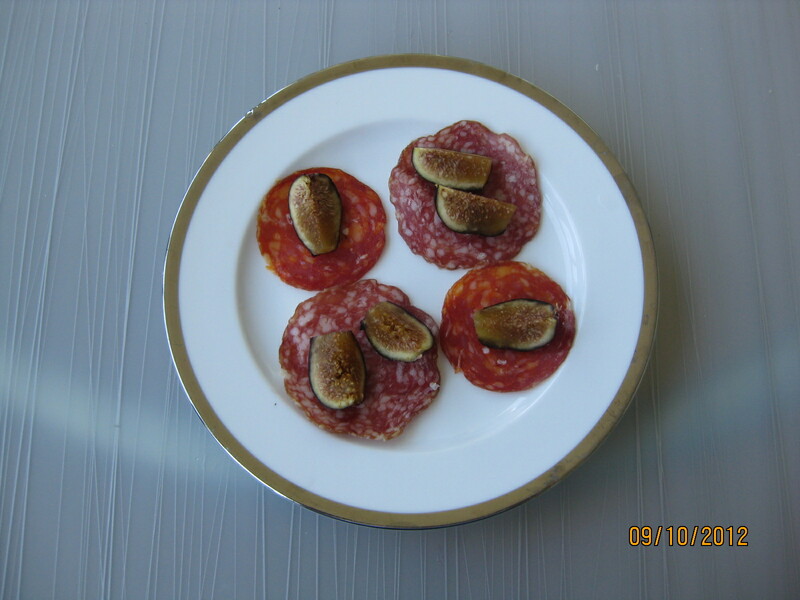 Whenever, I can get my hands on fresh figs, one of my favourite ways to eat them is as an appetizer or snack with salami. Sounds strange, but I find it a pretty delicious pairing of flavours. What place does salami have in a healthy diet? For me, the place is pure enjoyment of its taste. Yes, the nitrates and sodium are not so great for you…enjoying food in moderation is winning here for me. Pork fat is still of the moment in the foodie world-bacon donuts anyone? I actually ate a bacon apple fritter in April and I cannot say I loved that. Slices of pure lardo are served at Buca, it is delicious and simply melts in your mouth as you feel and taste it. The health claim of pork fat is its composition of 45% monounsaturated fat. Another concept to consider is historically, animal fat has been used for cooking and people were much slimmer in comparison to today. One could also argue that animal fat is less processed than many of the oil products we eat today. This is a recipe I developed this summer after being inspired by reading a recipe in the newspaper for an Asian salad from a food truck. This Asian flavoured dressing is great for a cold noodle salad, coleslaw or broccoli slaw. The sesame oil(antioxidants) and sunflower oil (vitamin E) are tasty, more unusual fats that add more nutritional variety to your diet. Blend all ingredients in a food processor until smooth. Adjust lime juice or agave syrup to your taste. Enjoy the dressing with packaged coleslaw, broccoli slaw, and adding cold noodles is an option to make a more substantial salad. Ps. Watch out for and join us for our small group training sessions including the water rowers in Toronto.